Tó éí ííná means, water is life, in the language of the Diné (the Navajo People), explained Celeste Yazzie. She paddled down the San Juan River in Southeast Utah with a dozen Diné Navajo Middle Schoolers from the non-profit Four Corners School of Outdoor Education and talked about the significance of water and Mother Earth, as taught and passed down from generation to generation by their ancestors. It’s a lineage that traces back to the Ancestral Puebloans whose ruins and sacred sites still endure in this red-rock landscape. Right now, this sacred ground lies in the middle of a bitter fight as Interior Secretary Zinke has proposed that President Trump shrink Bears Ears and other national monuments as well as weaken public lands designations and protections. Local tribes are dead set against the administration’s plans since they engaged in an unprecedented cooperative effort to create Bears Ears. Two summers ago, Yazzie, the Lead Experiential Educator of the National Indian Youth Leadership Project (NIYLP), floated down the San Juan on a three-day teacher training program. The Four Corners School of Outdoor Education, which is based out of Monticello, Utah, also led this trip. As Yazzie followed the river down the canyon, she realized there was a need to develop a program here for indigenous youth. That inspiration birthed an idea that has been oddly absent from current outdoor industry conversations: Get native kids out in the wild. Reconnect them to the lands of their ancestors. Empower them to advocate for this land, their birthright. Show them how they can understand more about their lifeline, that precious water. Water education is absolutely crucial here in the arid Southwest. Many homes on Navajo Nation land depend on well water, according to Yazzie. So the idea of partnering with Four Corners School made a lot of sense. Four Corners had the resources and certifications to guide the type of raft trips Yazzie had in mind for native kids. In turn, the school’s educators could learn more about the history of the land where their programs operate: the desert plateaus and mesas that, as of December 2016, lie within the boundaries of Bears Ears National Monument. Yazzie, who is Diné, first connected with outdoor recreation when she learned to climb and kayak while working on her undergraduate degree at the University of New Mexico. Six years ago, she started working for NIYLP. The three-decades-old New Mexico-based nonprofit organization developed an integrative educational program—Project Venture—that connects indigenous youth nationwide with outdoor adventure while teaching leadership, community values and traditional ideologies shared by Native cultures. Through river recreation, Yazzie theorized, kids from Navajo, New Mexico—170 miles south of Monticello on the Arizona border in the Navajo Nation Reservation—could learn more about their cultural heritage and and the importance of water in the wells in their community and the rivers in their ancestral landscape. It was a win-win. When he met Yazzie, Four Corners School Adventure Director David Taft was already in the midst of developing new youth programs with the goal of expanding outdoor access to underserved communities. He wanted to increase the spectrum of populations reached by the school. That effort is already in full swing. YouthWorks in the Park (which is led by the National Parks Conservation Association, Friends of Arches and Canyonlands Parks, and YouthWorks) introduces urban teens from Salt Lake City to southeast Utah’s national parks twice a year. The nonprofit SOS Outreach, based in Denver, Colorado, introduces at-risk youth to outdoor sports. Taft volunteered at SOS prior to joining Four Corners School in 2015. Unlike those successful organizations, Yazzie’s plan was to bring in kids whose connection to this landscape reached back for thousands of years. Taft secured funding and, in 2017, Four Corners launched two four-day NIYLP youth curriculums that integrated ecology, astronomy, anthropology and outdoor recreation through experiential learning and community service. The kids would go river rafting, hiking, star gazing at an observatory and camping. They would engage in citizen science via water collection and testing, and they would pick up trash at a lakeside beach. Taft also debuted programs last summer that included one for at-risk, inner-city youth from Salt Lake City and another for refugee youth from the International Charter School. NIYLP Program Manager Heather Campbell led the second indigenous program for middle schoolers, who were accompanied by tribal elders. The Diné people (their name for themselves as opposed to the common term Navajo) have occupied the Southwest region for a couple of centuries. 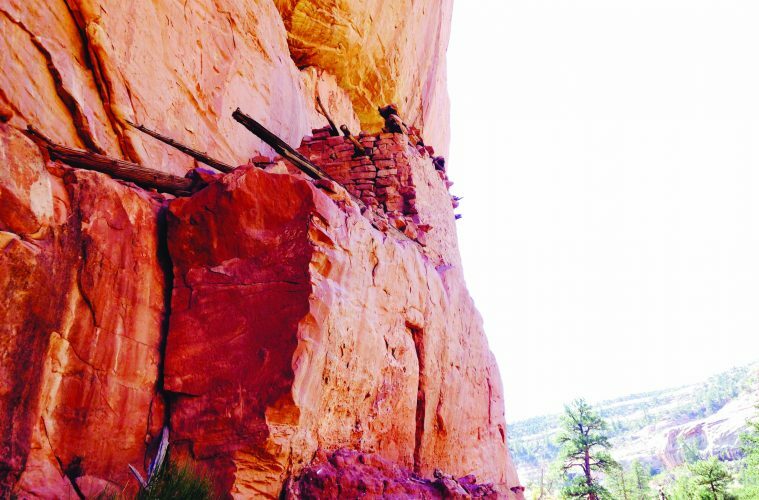 The lineage of the Ancestral Puebloans, however, traces even further back thousands of years. Four Corners School was founded in 1984, by former Executive Director Janet Ross. Initially just an outfitter, the education center now prioritizes land stewardship, STEM education, and experiential learning through outdoor recreation. Their ultimate mission is to teach people about the natural and human history of the Colorado Plateau, an area nearly as large as California. Encompassing the Four Corners region, the plateau is chock-full of 12,000-foot peaks, the Grand Canyon, and otherworldly geologic formations—including ones of American Indian significance, such as the two iconic Bears Ears buttes—plus more than 100,000 archeological sites, which now sit inside the Bears Ears National Monument boundary. “Fifteen years ago, Moab boomed as a tourism destination and the City of Monticello proposed that Four Corners open a science and nature center to help breathe life and tourism dollars into the local economy,” explained the school’s Executive Director Chris Giangreco, who also voiced the importance of a multidimensional approach to growing the local economy. In August 2016, the Four Corners School opened its Canyon Country Discovery Center after more than a decade of dedicated fundraising efforts. The once sleepy town of Blanding has been in the crosshairs over the national monument deabte—in short, proponents want to ensure the monument’s cultural and environmental resources are protected and they think the only way to do that is to up legal protection and federal oversite. Opponents think the area is just fine as it is and don’t want more federal control. The area’s diverse communities include a mix of indigenous tribes, Mormon settlers, ranch families and miners from the uranium boom. The loudest voice in the monument designation debate from the side who wants to cut Bears Ears comes from Utah Congressman Rob Bishop. His initial Public Land Initiative (PLI) proposal, an alternative to the monument, included 90 percent of the region that is now the monument. That proposal looks good now with rumors that Trump may cut the size of the monument dramatically (though it’s still unclear whether he has the legal power to do so). On the preservation side, it’s outdoor industry brands: Patagonia invested $1.7 million in a Bears Ears campaign that included a beautiful, interactive digital piece and boycotting the Outdoor Retailer trade show as long as it remained in Utah. It has since moved to Denver. When Zinke visited the monument in May to assess if it should be cut down in size, he ignored supporters in favor of locals opposed to the designation. And he only briefly met with two tribal leaders before taking off on a helicopter tour. The tribes felt betrayed. Bears Ears had been a rare victory for Native concerns in the West. As the land rivalry escalates, this power play pitting big outdoor industry brands like Patagonia and Black Diamond and national environmental organizations against conservative Utah politicians and the Trump Administration has become even more unsettling for the locals. Many voices are muffled. “There’s a lot of antagonism between the Black Diamonds and Jim Stiles [a local writer and editor opposed to the monument] views, but I think it’s irrelevant. This area should be a UNESCO World Heritage Site,” said Taft. All the while, the monument’s defenders’ concerns remain: the potential denial of tribal access to sacred ceremonial sites or use of natural resources, recreation across user groups, plus current and new business operations such as research conducted by the Four Corners School, outfitters’ trips or energy developments. “With the larger national debates going on, those of us who are right here feel disconnected from the land we’ve always been on. Right now, the uncertainty about the monument and the new management plan—which will be put in place by Federal agencies and dictate how the land can be used—is a challenge for most people in the area,” explained Giangreco. Monticello sits in San Juan County: the fastest growing county in the U.S., with a 7.6 percent population surge in 2016. Simultaneously, 28.1 percent of the county’s population lives below the state poverty line—a rate that is more than double that of the rest of Utah. Ethnically, 70 percent of San Juan’s impoverished locals are American Indian followed by 22 percent White and six percent Hispanic, reports Data USA. “Parents in the local community are busy working and making sure their kids have a good life. When you’re trying to make ends meet and you have three kids, it’s hard to drop everything and spend the week out camping,” Giangreco explained. Most of the kids who visited the San Juan River from Navajo Middle School had never been rafting before. They didn’t even know about the San Juan river’s recreational access. “Indigenous populations are not exposed to outdoor recreation as much as Westerners, mostly due to the cost. Outdoor sports are expensive,” explained Yazzie. “In the outdoor education world, you don’t hear much about indigenous people. I am honored to be a part of the NIYLP team. We are all natives and guides of outdoor sports including mountain biking, kayaking, canoeing, and backpacking,” she said. Both nonprofits intend to further develop the programs next summer. In the end, and no matter the fate of the monument, the focus of the programs with the kids comes back to that essential, ancient idea that water is life. Yazzie hoped the students would step off the rafts with a deeper understanding of water’s sacredness, a core view that is shared across indigenous tribes. “Water supports all life and all that is living—animals, crops, nature, land, and the self—holds value, which should be respected and cared for with intentionality,” she said. Due to her efforts and those of groups like the Four Corners School, the next generation may be able to live those ideals.